Golf equipment can say a lot about a golfer and no other piece of equipment says a lot about a golfer than their golf bag. Be it a cart bag, stand bag, or even a staff bag, the golf bag is what golfers notice about other golfers first and foremost. The latest golf bag offerings from Callaway certainly deserve to be noticed and THP was given the task of reviewing two of their newest entries, the Hyper-Lite stand bag and the RAZR stand bag. 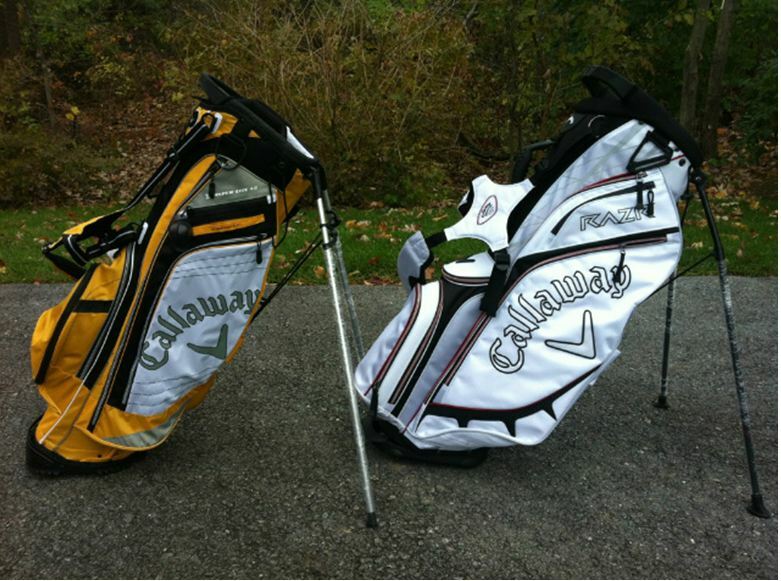 Both offer something different while performing the same task, carrying your golf bags with style. What makes these bags special? Check it out. When I first pulled the Hyper-Lite 4.5 (4.5lbs that is) stand bag out of the box I immediately thought ‘man this is really a light bag.’ Without even taking it out to the range or course and I know this is going to be a great bag to walk with if that is what you are into. 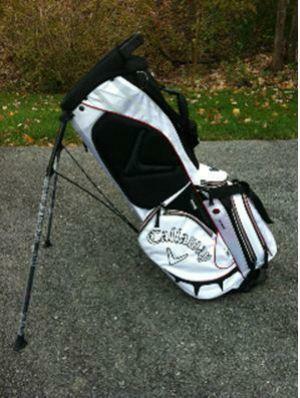 Next I can’t believe how well Callaway has maximized the useable space that this bag has to offer. 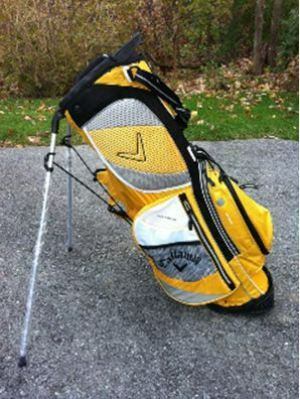 This bag is meant to carry your clubs as well as a few other things in its 11 pockets. Maximum effort with minimal fuss. While the integrated handle isn’t overly thick it does the job and allows you to maneuver the bag in and out of your trunk as well as off and on your golf cart. I don’t walk courses too much but when I used to with my older stand bag the strap was only of the single strap variety which could be difficult on whichever shoulder I happened to be using. The Hyper-Lite actually gives you the option to use the 4 point strap as a single or double (4 point) strap which gives better balance to the bag on your back which ultimately adds to the versatility of this simple bag. I found it easier on my back to use the four point option which helped the bag stay put and kept it from slipping and sliding around. Having this bag on your back doesn’t even feel like you’re carrying a golf bag. I did notice a bit of club chatter when testing this bag which could be caused by the minimum amount of individual tops on the bag for your clubs. I found this bag to be very secure on the ground as well. Once you set the bag down on the ground and tilt it forward to deploy the legs the bag isn’t going anywhere. The XTT base digs in and provides a solid base where the bag does not tip to either side which was great to see. One real nice feature that this bag has is the foam padding on the one side of it which minimizes the abuse your back takes from carrying 14 clubs around. Simple yet effective solution that makes walking a little more enjoyable. Pockets? Oh yeah, there’s 11 of them which is quite astounding for a stand bag this light so you should have plenty of places to store whatever it is you need to make your on course experience more fun. 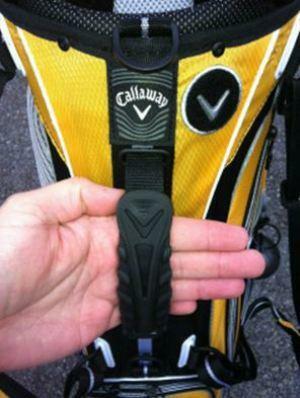 Now let’s check out another member of the 2012 Callaway golf bag family, the RAZR stand bag. Now when you first see this bag in person you can’t believe you’re looking at a stand bag Frankly it looks more like a cart or even a staff bag. Yes, it’s that good looking. I never thought that a predominantly white golf bag could be good looking let alone practical in terms of keeping clean, etc. This is one of the most sturdy stand bags I’ve seen/felt yet it’s still relatively light. Albeit not as light as the Hyper-Lite featured above but it’s still a bag that you can wear comfortably. The RZAR stand bag is a looker but it’s not just a pretty face, it’s got some brains too, or features in this case. The features listed above go far beyond what they say they do. 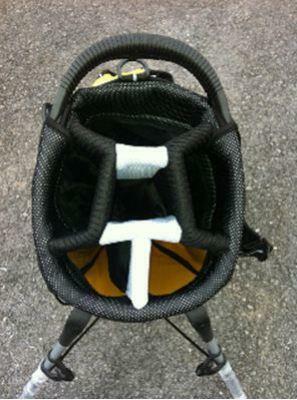 I love seeing a stand bag that has a lot of individual divider slots and this bag certainly delivers the goods on that. While it only has 3 full length dividers the 14-way top is a winner and I think something that more stand bags should embrace. A subtle detail that I think is really unsung on this bag and on any bag for that matter is the handle. The dual molded handle on the RAZR stand bag is thicker, feels sturdy, and makes it especially easy to maneuver the bag in and out of the trunk of your car. Like the Hyper-Lite you have the option to use the 4 point strap as a single strap or as the 4 point strap which makes this bag that much better. I wonder if I can keep this bag clean? Let’s see. After testing the Hyper-Lite stand bag I was anxious to see if the RAZR could surprise me as well and it didn’t disappoint. The bag feels great on your back and you have easy access to most of its 11 pockets which is super convenient. The extra padding on the 4 point strap comes in handy when carrying this bag. I did find it easier to use the four point option which helped the bag stay put on my back but I did notice some slipping and sliding back there and I think that comes from the mesh found on the bottom of the straps. It felt almost ‘slick’ and didn’t grip my shoulders as well as I would have thought. Club chatter wasn’t as noticeable and I suspect the 14-way top helped keep my clubs aligned not to mention organized. The 14-way top also helped me find clubs easier and faster as they were neatly divided from the others. The insulated water bottle pocket kept whatever beverage I could put into it nice and cold as well which is a key feature for me. I was very impressed with both of these Callaway stand bags. Both are similar yet offer a little something different for every kind of golfer. The Hyper-Lite stand bag retails for $169 while the RAZR stand bag retails for $199. Check out www.callawaygolf.com to see what other color options are available on these two models if the two colors tested here don’t strike your fancy. 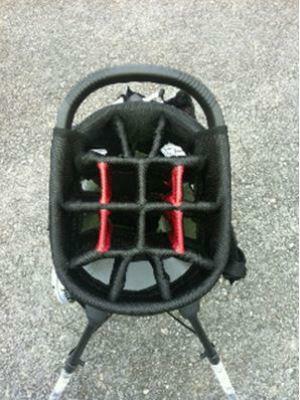 You want your bag to say something about you so why not make sure you have the right bag for you and your game? Multiple options and choices are good and Callaway is certainly giving the golfer plenty to think about with these two particular stand bags. Choose wisely my golfing friends. I like the look of these bag as well as the storage. Really like the Razr and the loving the 11 pockets on the Hyper-lite. How will they hold up in the rain? Nice review Todd! Really like the looks of the Razr and it would definitely be in consideration if I was a walker with the 14 way top. Nice review Hanks, enjoyed reading! I am pretty impressed by the spec on the Hyper-lite. Looks like a versatile bag with plenty of storage. nice review todd! even better looking in person. Nice job! I really like the dividers on the Razr. I thin once you have a 14 way, you never go back. Nice review Todd! The RAZR bag looks great and if it manages to stay light with all those dividers and space, it’s a real winner. These seem to be great bags! Solid job Todd! 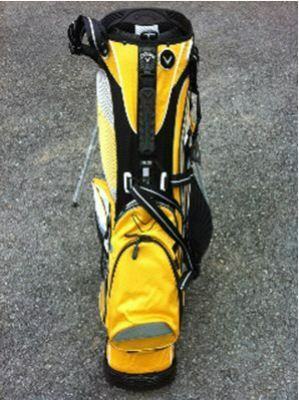 I’m digging the Razr stand bag bro. I love that it has a 14 way top. If I ever go back to a stand bag, it would be high on my list. Thanks for the write up. The RAZR is great looking. Maybe the best looking stand bag on the market right now. Sounds like there is plenty of features to back up the good looks too. Thanks for the informative review, Todd! Great review! My biggest issue with finding a good stand bag is that often it’s hard to find one that looks great but still has the 14-way top. Callaway got it right with these. Really GOOD Review Todd ! I really like the looks of that Razar bag, and I also like that it has the 14 way top on it. 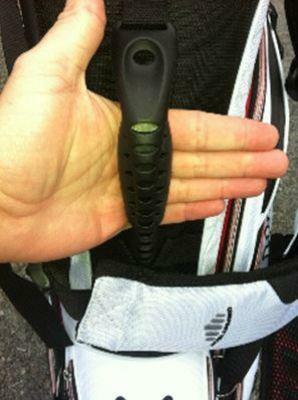 If I were a golfer that carried, I’d be giving this bag a LONG HARD LOOK !! Very nice review T! When you first put up pics on THP I was immediately drawn to the RAZR but after reading the review and seeing more of each bag I might actually like the Hyper-Lite better. Both bags look great and you did a great job on the review, thanks! Solid review Todd. Personally, I prefer the looks of the RAZR over the Hyper-Lite. Gotta love the individual dividers, that’s always been a big selling point for me. Love the RAZR bag. It caught my eye immediately and I love that it’s a carry with 14-way. I like the white bag. If I used stand bags, this could be it. Great reviews! The Hyper-Lite and RAZR bags are going to get a second look from me. oh man, that RAZR bag is suuuhweeeeet. Great breakdown and review! I really like the 14 way divider. Callaway has a couple of beauties here. Nice write up too! Fantastic review Hanks! Very in depth and I think I’ll be looking at both bags when it comes time for a new one! Really good review Hanks, the RAZR really is nice, I checked out the website and I like the red one the best followed by the white and then the black. Each color looks great and I would actually proudly game any of the three. The bag looks great, exactly what I am after and I’d buy one tomorrow except for the fact it seems they are not released in the UK. 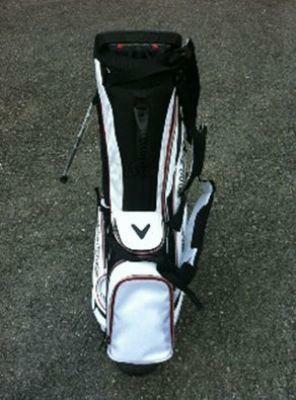 I purchased the Callaway FT (Fusion) bag nearly two years ago. Incredible bag. Very sturdy, great stand assembly, best pocket configuration ever, and a quick release strap for conversion to a cart bag. My bag recently came apart at the seam and Golfsmith and Callaway were fantastic about the warranty. They replaced with the RAZR. TERRIBLE bag. My clubs get tangled due to the awful divider system, the pocket configuration is not as user friendly as on the fusion, the stand is very cheap and does not retract all the way, and I miss the velcro glove attachment the FT had. The comfortable is about the only good feature of this bag, Callaway should revisit the design of the FT. I am going to call first thing in the AM and see if I can get my FT back and I’ll get it repaired. Is the water bottle pocket big enough for a “Nalgene” bottle, or just big enough for a regular 16 oz bottle?